One of the biggest differences since we moved into a house is the sleeping arrangements. When our oldest daughter was a baby, we were living in an apartment with a traditional Japanese straw mat (tatami) room and no bed. So like most families in Japan, all three of us slept on futon in the same room. No crib for the baby; she had her own tiny futon…and as she got bigger, she would roll her way around nearly the entire room at night time, sometimes eventually kicking one or both of us in the head at some point. Typically, doctors in the US advise parents to have their kids sleep in separate rooms from around six to eight months old. This is thought an appropriate age to encourage independence among young children, in part to reduce the effect of separation anxiety. Recent suffocation deaths in the US and the UK have been tied to “co-sleeping,” which is when the infant sleeps in the same bed as the parents. Posts online about when and where small children sleep almost always assume that the child is in a crib until the age of 2 or so. However, in Asian countries, it would be almost unheard of for parents and children to sleep in separate rooms, even when children approach elementary school age. Cribs are rare, and also expensive. We found out, too late, that we could have rented a crib on a monthly basis. Instead, from the moment my first child was born, we had a “baby futon,” which was placed next to my wife’s futon. When my oldest daughter got too big, she got her own futon and the baby futon was used for naps at home…until the second daughter came along. When we built a house, I demanded a bed. Besides my back showing some wear and tear in the my late 30s, I also found it more and more difficult to breathe prone on the floor (I have asthma, and allergies to boot). I also wanted my kids to sleep in their own bedrooms, now that we had them. My wife agreed; after all, she and her siblings eventually had their own rooms, too. 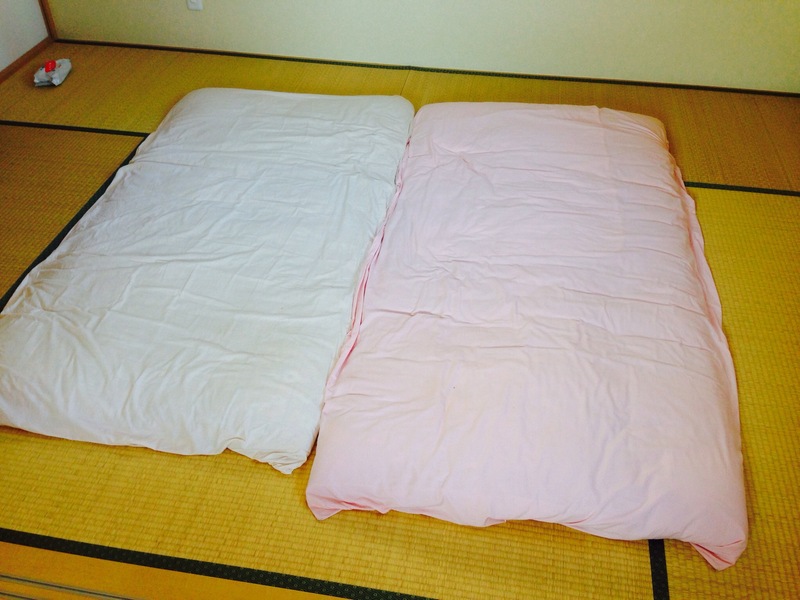 Once my wife and I started sleeping in the master bedroom, and the kids were sleeping on futons in their second floor tatami bedroom, we found it difficult to have the kids go to bed by themselves. Even now, my wife and I frequently have arguments about how to have the kids to bed. My position is basically a typical American position: put the kid to bed, and leave her there. If she cries, go back and calm her down, and then leave again. Repeat until she gets the point. US pediatricians generally recommend that kids learn to go to sleep by themselves starting around six months old, and certainly by the age of one. My wife simply can’t do this. She stays with both kids, patting them on their backs or stomachs as they lie on the futon, until they go to sleep. This can take up to an hour or more, depending on how excited they are from the day’s activities. Last year she bitterly complained that she was always responsible for putting the kids to bed, and when I retorted that we should have the kids learn to go to sleep on their own, an out and out shouting match resulted (and nobody went to sleep…not an ideal result). Things have improved since last year, but as my youngest has entered the terrible twos, she is beginning to experience nightmares and has become more and more afraid of the dark as her imagination increases. I still feel as strongly as ever that the kids should go to bed on their own now, with us checking in on them. It’s difficult to convince the kids to go to sleep much earlier than 9:30 or 10 pm, because they both have nearly 2 hour naps at the nursery school. Looks like an ongoing struggle with the Sandman…. This entry was posted in gender roles, Japan, parenting, roles and tagged child-raising, cultural differences, Japan, parents. Bookmark the permalink.